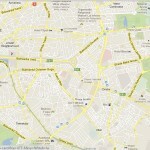 The city of Bucharest was first mentioned in 1459 and became the capital of Romania in 1862. 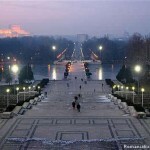 Bucharest is situated on the banks of the Dâmbovița River, which flows into the Argeș River, a tributary of the Danube. 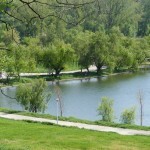 Several lakes – the most important of which are Lake Herăstrău, Lake Floreasca, Lake Tei, and Lake Colentina – stretch across the northern parts of the city, along the Colentina River, a tributary of the Dâmbovița. 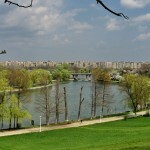 In addition, in the centre of the capital there is a small artificial lake – Lake Cișmigiu – surrounded by the Cișmigiu Gardens. 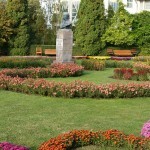 The Cișmigiu Gardens have a rich history, being frequented by poets and writers. 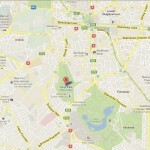 Opened in 1847 and based on the plans of German architect Carl F.W. 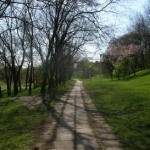 Meyer, the gardens are the main recreational facility in the city centre. 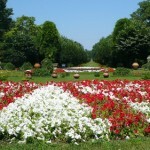 Besides Cișmigiu, Bucharest contains other parks and gardens, including the Herăstrău Park and the Botanical Garden. 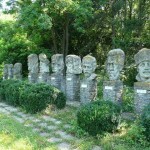 The park is located in the northern part of the city, around Lake Herăstrău, and includes also the site of the Village Museum. 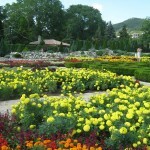 The Botanical Garden is the largest of its kind in Romania and contains over 10,000 species of plants (many of them exotic) and used to be once the pleasure park of the royal family. 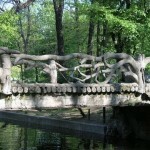 Parcul Herastrau is the biggest park of Bucharest, placed in the northen part of the city. 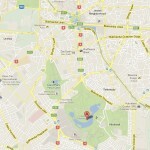 It has a surface of around 110 ha, the Herastrau Lake having a 74 ha surface. 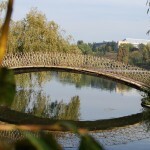 The alley which surrounds the whole lake has a length of 5,92 kilometers. 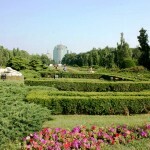 The Herastrau Park is surrounded by the Aviatorilor boulevard – Beijing boulevard – Nordului highroad – Elena Vacarescu street – Bucuresti highroad – Kiseleff highroad. 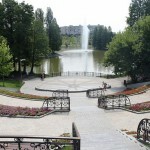 The park has a summer theatre, exposition pavilions, nautic and sport clubs, coffee houses, clubs and restaurants, a hotel and other facilities. 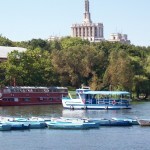 The Herastrau Lake is used for recreation, nautic sports and navigation. 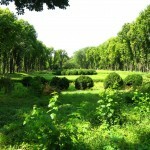 Herastrau Park has a vast offer of tree vegetation, containing species of willow, poplar, maple, ash and lime. 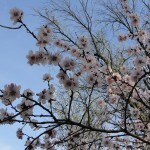 When walking in a sunny spring day through the alleys of Herastrau Park, a visitor will discover areas such as Expo Flora, Roses Island, Poplar Island, or the Japanese Garden, the latest being developed with the support of the Japanese Embassy in Romania and Comemorative Foundation of Japanese World Exhibit. 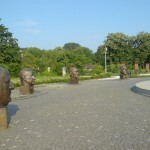 Carol Park is a public park, named after King Carol I of Romania. The park has officially been listed as a historical monument since 2004. 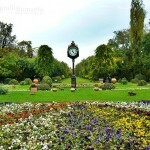 The park was designed by French landscape artist Édouard Redont in 1900 on Filaret Hill, under the supervision of Constantin Istrati, then president of the Romanian Academy. It was inaugurated in 1906, on the 40th anniversary of the coronation of King Carol I. 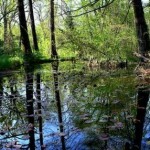 The park had an initial surface area of 36 hectares, including the 20,000m² lake Filaret. It hosted the 1906 Bucharest Exhibition, and included many pavilions and buildings, of which only the Technical Museum and the open air Roman Arenas survive. The Tomb of the Unknown Soldier, inaugurated in 1923 in memory of Romanian soldiers fallen in World War I, was dismantled and moved in 1958 to Mărășești, being replaced by a Mausoleum of the Communist Heroes. 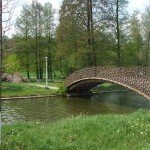 In 1991 it was returned to the park, to be moved again in 2007, closer to its original location. 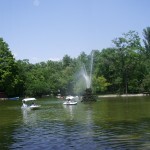 Aside from its beautiful vegetation and panoramic views, the park also includes several monuments, such as a Mausoleum, the Cantacuzino Fountain (built in 1870), the Giants’ Statues, the Zodiac Fountain (1934), the Technical Museum (first opened in 1909), a monument in the shape of a small mosque built in 1923 as a sign of reconciliation. 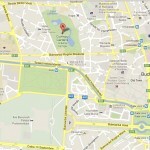 Also in the park are the open-air Roman Arena, and the Astronomical Institute of the Romanian Academy. 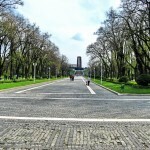 The Carol Park Mausoleum, known during the Communist régime as the “Monument of the Heroes for the Freedom of the People and of the Motherland, for Socialism”, is located on a plateau. Formerly, it was the site of the Arts Palace and later of the Military Museum, with the fountain in front of the latter museum. The base is circular and plated with black granite. Above rise five narrow arches covered with red granite. Inside the base there is a rotunda covered in red granite plates; the ceiling is decorated with a golden mosaic. 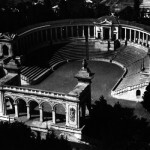 Prior to the Romanian Revolution of 1989, the rotunda contained the crypts of Communist leaders Petru Groza, Gheorghe Gheorghiu-Dej and Constantin Ion Parhon. When it was built, an eternal flame burned on an upper terrace near the monument, in a granite amphora. This was intended to preserve the memory of those who had fought on behalf of the working class. The park drew national attention in 2003 when the Romanian government agreed to allot 52,700 m² to the Romanian Orthodox Church for the “Cathedral of National Redemption” project. The cathedral, although popular among the citizenry and supported by the government, drew criticism because it was to be placed on the site of the mausoleum. Symbolically, replacing the mausoleum with a church was seen by some as a removal of painful memories, similar to the removal of other communist statues and symbols. On the other hand it was argued that it served as a reminder of Romania’s fight for democracy. 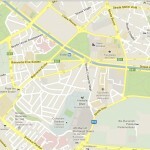 In addition, the building was seen as an architectural monument and drew the protests of Romanian architects. The cathedral site has since been moved next to the Palace of the Parliament, after a successful campaign lead by Remus Cernea, the leader of the Romanian Humanist Association at that time . 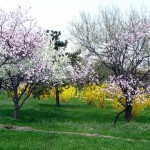 The Botanical Garden “Dimitrie Brândză” of the University of Bucharest is located in the Cotroceni neighborhood and covers an area of ​​17,5 hectares (including 4,000 m² of greenhouses), and over 10.000 species of plants. 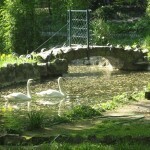 The first botanical garden in Bucharest was founded in 1860, near the Faculty of Medicine by Carol Davila. The garden was moved to the current space in 1884 by Dimitrie Brândză, a Romanian botanist, and by Louis Fuchs, a Belgian landscape architect. The garden was opened in 1891, after the greenhouses were built and populated, but was affected by the flooding that occurred in 1892. 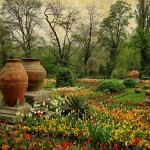 The garden was damaged during World War I, when it was used by German occupation troops, and World War II, when it was hit by Anglo-American bombing on 4 April 1944. Then, from more than 700,000 exhibits were saved only 200.000. Bucharest Botanical Garden Herbarium was back to about 500.000 exhibits, organized into two major sections. The Botanical Garden Museum is located at the entrance to the Garden, in a autochthon style. 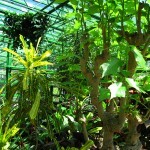 In this museum are exposed to over 5.000 species of plants, including 1,000 exotic species. Old greenhouse of the Botanical Garden was built between 1889-1891, modeled greenhouses in Liège (Belgium). In 1976, it was closed to the public, continuing to house only crop plants. The main hall was rehabilitated in 2011 and was designed as a corner of rainforest and contains representatives of many exotic plant families. 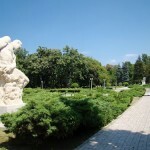 Tineretului Park is located close to the Unirii Square, the city center, with an area of about 200 hectares, being currently the largest park in Bucharest, by land surface. 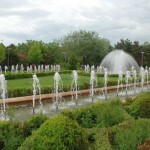 The park is set in an area, which was called in the past “The Valley of Weeping”. This area was leased in 1940 by contract to the Comunal Factories of Bucharest for landfill for 25 years, being then transformed into a park area. 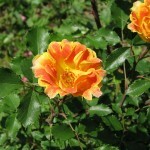 The development of the park began in 1965 and works lasted until 1974. 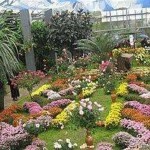 Basic arrangement lasted only eight months, accomplished with the contribution of youth patriotic labor. Significant differences in level (up to 16 m) required field modeling in order to highlight the Mirror of Tineretului Lake, which spreads over 13 hectares. In the ’80s, the park was expanded to the east, with the construction of the Palace of Pioneers and Falcons Fatherland, National Children’s Palace today. 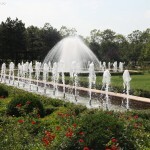 The Cișmigiu Gardens are a public park near the center of Bucharest, spanning areas on all sides of an artificial lake. 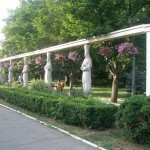 The gardens’ creation was an important moment in the history of Bucharest. 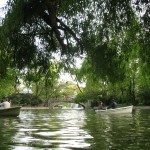 They form the oldest and, at 17hectares, the largest park in city’s central area. The main entrance is from Regina Elisabeta Boulevard, in front of the former building of the City Hall; there is another major entrance at the Știrbei Vodă Street, near the Creţulescu Palace. 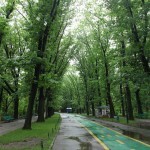 The southwestern corner of the park is adjacent to the Gheorghe Lazăr High School. Romanian Round or Rotonda Scriitorilor (“Writers’ Rotunda”) is a circular alley which has stone busts of twelve important Romanian writers: Mihai Eminescu, Alexandru Odobescu, Titu Maiorescu, Ion Luca Caragiale, George Coşbuc, Ștefan Octavian Iosif, Ion Creangă, Alexandru Vlahuţă, Duiliu Zamfirescu, Bogdan Petriceicu Hasdeu, Nicolae Bălcescu and Vasile Alecsandri. 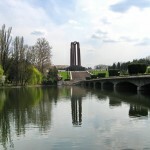 The Monument of French Heroes commemorates French soldiers who died fighting during the World War I Romanian Campaign. The Sissi Stefanidi spring, created by Ioan C. Dimitriu Bârlad (1890–1964), depicts a mother, aggrieved by the death of her daughter, pouring water from a pitcher. 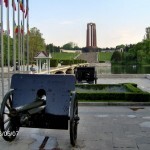 The park was built in 1847, at a time when Bucharest was the capital of Wallachia, on a site formerly known as the “Lake of Dura the merchant”. The pool it replaced was a popular site for fishing from as early as the 17th century, and was inhabited by mallard colonies. A part of the present-day gardens was occupied by a vineyard, which was planted around a water source: the latter had been tapped during the bubonic plague epidemic of 1795, when the two sons of PrinceAlexander Mourousis took refuge in the largely uninhabited zone. The decision to replace the lake was taken in 1846, during a period of Imperial Russian administration It was based on an earlier proposal made by Russian governor Pavel Kiselyov in 1830, and various small-scale works had first been undertaken in 1837. 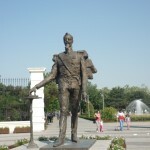 The initiative, countersigned by Prince Gheorghe Bibescu, was part of a series of major public works, and the plan dates back to 1844. On February 27, 1845, the area passed into public ownership through a princely decree. The word cișmigiu comes from Turkish: a Ceșme is a public fountain and a cișmigiu (or cișmegiu) used to be the person responsible for building and maintaining public fountains.The name replaced older references to Dura, and was coined by the public because, at the time, the administrator of Bucharest fountains was living on park grounds (in a house located between the central lake and Sărindar quarter). In 1882, the gardens were fitted with electrical lighting. Seven years later, the Gheorghe Lazăr High School was built on its southwestern corner (it was to be extended during the 1930s). During the late 19th and early 20th century, Cișmigiu became noted for housing the Thierry Restaurant, kept by a Frenchman, and various amateur photographers who made affordable portraits. The building in front of the park was assigned to the City Hall during the communist regime. 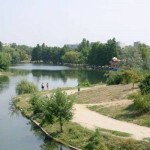 Alexandru Ioan Cuza Park (also known as Titan Park or IOR Park) is located in the central-eastern part of Bucharest, in Sector 3, the area bounded by streets Ressu Camil, Alan Rebreanu Liberty Plain, C-tin Brancusi, Baba Novac and Nicolae Grigorescu. The place of recreation for neighborhood residents Titan, Dristor. Acronym of one of the park’s alternative name, IOR, comes from the name optical businesses Romanian factory, located in the vicinity. 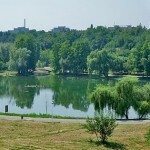 With an area of ​​about 85 ha, is one of the largest parks in Bucharest. The development of the park began in 1965 and ended five years later. Before fitting, the section from Str.Baba Novac was called “Reconstruction” and the Bd.Camil from Ressu (formerly Ion Sulea) was called “Flax”.